I wanted additional rear lighting above my stock tail/brake light. I had used a similar LED on my FJR and decided to add one to the GSA as well. The LED I used is a $14.99 surface mount Emergency Vehicle light ( Link to Amazon ) It is connected through the EZCan. I drilled two holes in my top box, one 1/4" hole behind the light, the other a 3/8" hole at the right edge of the bottom mounting plate. I ran the lead from the back of the light through the Top Box, and out the bottom hole through a rubber grommet. No grommet was required behind the light due to the lead molded configuration. I ran the lead into the compartment behind the tail light accessed by removing two screws underneath the rear fender. I used a two lead waterproof connector there to facilitate removing the top box. I then ran the lead up into the under pillion area where the EXCan is located and used another waterproof connector supplied by EZCan. As you can see this LED is much more visible than the stock light and it is controlled by the EZCan so it flashes when you slow or brake. Crowbar and Ripcord like this. That is bright! I agree that BMW tail lights are horrible. Its first thing I do also, add some hyperlights or skene lights. I will need to take a close look at this set-up when you are over this way. I had one of those on my Super Tenere and it was a real attention getter. Did you consider putting on the bike? Do you think it will fit an place? I considered putting it on the bike but wanted it to be higher. As the Top Box stays on my bike 98% of the time I decided that was the best place for it. This light draws minimal current, could easily be wired into the tail light/stoplight. As stated above, I wanted it high for additional visibility thus the Top Box Mount. I'm not certain where you could mount it with any great deal of visibility if you didn't use the Top Box. I'm in the same boat with my '06. Found an LED replacement light unit that's much brighter, but also about $90 and still just a single light in the stock location. 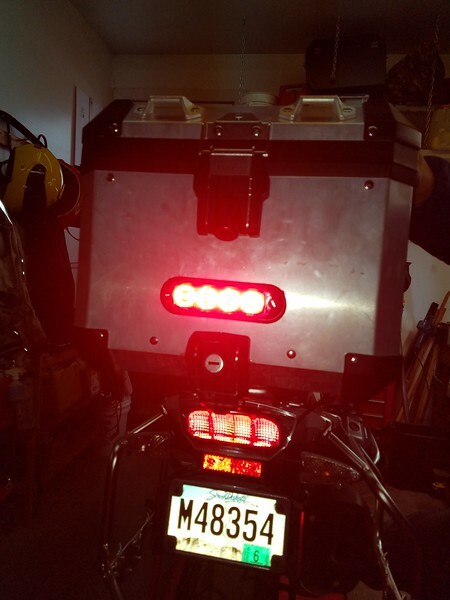 I've been thinking about how the incandescent taillight on my bike works, and the way the controller will pulse-modulate the brake light if it senses the running light has burned out... I've found there are 1157-base LED bulbs on Amazon, etc., that claim to be brighter than standard incandescents but draw 1/3-1/3 the current... which leads to the idea of putting one in the standard taillight housing, and two or three more in auxiliary housings on the back of panniers, or maybe on pannier brackets (something to create a triangle rather than the single point of the stock light. Haven't gotten around to trying anything yet, though. Last edited by saughblade; 27-Jan-2019 at 01:37 PM (817). This unit only draws Four (4) Watts - very unlikely that 4 watts will even be noticed by a CANBUS system. Ah.. didn't catch that. Well, looks like I have a project... once the temperature gets back up above zero! On this subject and my lack of knowledge for CANbus, I found this helpful. Motorcycle Info Pages - R1200GS Electrical stuff > CANbus - what's that? The author has posted a large volume of r 1200 GS "how to" stuff and pages of specs and info. I have this installed on my "05. Pertinent to anything I want to add on. Filcat and stuckinohio like this. Last edited by Southpaw; 27-Jan-2019 at 03:30 PM (896).